From coral caves to sacred glades, from windswept peaks to shadowy streets, magic can still be found. Mermaids sing below the waves and the little people dance in the circles of their human neighbors. Some mortals even know the touch of the Fair Ones on their lives by the blood in their veins. But not all dreams are happy ones nightmares and creatures cluster in the dark places, waiting to devour the unwary. 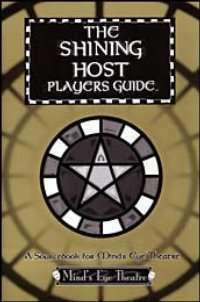 The Shining Host Players Guide is rich with new material for players and Storytellers alike. Here are the long-awaited rules for the Nunnehi and their ways. Here are the merfolk with their arts of weather and seduction, the fae-blooded kinain and the ranks of the enchanted. Here also are the houses of the Unseelie and the terrifying Court of Shadow.